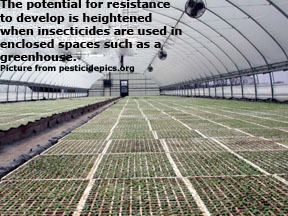 The insecticide is used in enclosed areas such as greenhouses where there is little or no immigration of susceptible insects. The insects have multiple generations per year and many offspring per generation. 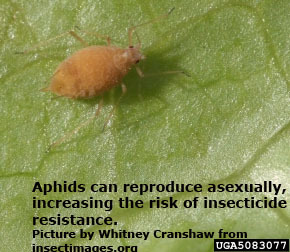 This effect can be compounded with insects that reproduce asexually, such as aphids. The insects are highly susceptible to the insecticide. If a species is highly susceptible, only resistant insects survive the treatment and reproduce. The insect population has a high initial frequency of the genes conferring resistance. When insecticides are used under these conditions, it is imperative to treat alternate generations of pests with pesticides that have different modes of action or a non-chemical tactic. Is Resistance to Blame? — Resistance is not the only reason for insect control failure. Raised Resistance Risks — Conditions that favor increased potential for resistance to develop and spread. Insecticide Resistance Mechanisms — There are several ways that insect populations can become resistant to insecticides. Take Steps to Avoid Insecticide Resistance — Ways to slow and prevent insecticide resistance from developing. Spraying by the Numbers — Insecticide classification scheme that distinguishes modes of action by group numbers. What can you do about Resistant Insects? — What you can do if resistance is already present. Resources and Suggested Reading — Additional information about insecticide resistance.